Universal pre-K: France is about 180 years ahead of America on preschool education. Universal pre-K is a long tradition in France, and one that American parents might envy. In this series, an American in Paris pits the French welfare state against the U.S. market economy in five key categories: childbirth and health care, preschool, higher education, immigration, and shopping. Read all the entries in the series here. I started the New Year in Paris with a mission: to enroll my daughter in école maternelle, France’s universal preschool program. This required a visit to our local city hall. As I walked across the park that sits between it and my apartment, I felt a little emotional—Sophia had just turned 2 in November, and now in just a few months she’d be headed off to school? It didn’t seem possible. But I had no second thoughts about sending her to maternelle in the fall. Though school isn’t mandatory in France until age 6, all 3-year-olds are guaranteed a place in maternelle, and over 95 percent of French 3-to-5-year-olds attend. It’s the one part of France’s educational system that everyone seems to agree is great. It’s also remarkably cost-efficient: France paid 12.8 billion euros in 2007 to educate just over 2.5 million preschool age children—a cost of about 5,000 euros per student, or about $6,700. (By way of comparison, the state of New Jersey spends about $13,000 per student in their own, nonuniversal pre-K program, and Mayor de Blasio proposes allocating about $10,000 per student in New York City.) In the U.S., fewer than three in 10 4-year-olds are enrolled in pre-K programs, and we rank in the bottom third of developed countries in early childhood education, according to the Organization for Economic Cooperation and Development (OECD). Universal preschool has become a hot topic in the U.S. this year, with everyone from Barack Obama to New York City Mayor Bill de Blasio to conservative Oklahoma legislators coming out in favor of some form of public pre-K education. Politicians, economists, and educators are citing two studies, the Perry Preschool Study and the Abecedarean Project, both of which followed low-income kids who’d received public preschool education. Both studies found enormous benefits in early education; the children who received it were much more likely to hold down jobs, have savings accounts, and stay out of prison than their non-preschool-educated counterparts. Soft skills learned in preschool—how to regulate emotions, how to work in a group—were shown to be helpful later in life and harder to train into people as they got older. Many economists, among them Nobel laureate James Heckman, have advocated for preschool as one of the most efficient uses of education dollars. France has been all over this for nearly two centuries. The first écoles maternelles began here in the 1830s, initially intended as a combination of child care and schooling for the children of poor families. Gradually they grew into a fundamental building block of the French education system. The three-year curriculum is designed to move kids from the free play of the early years toward the more structured world of elementary school. Much of maternelle focuses on language, and on achieving a level of fluency for all children regardless of background. 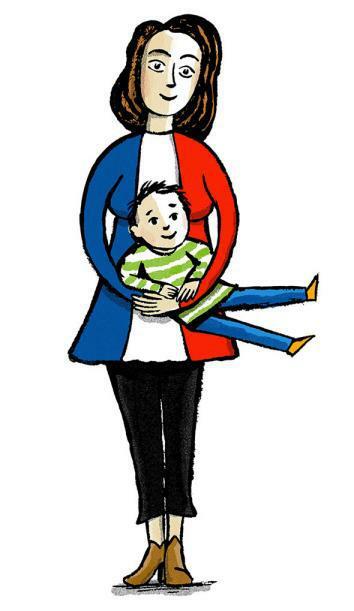 Dominique Fortier, a maternelle teacher in the Paris suburb of Asnières, sees this as a major equalizing force. “Children who come from families where they don’t speak French will learn French, and the idea is to bring everyone to a sort of moyenne—a middle ground,” Fortier says. Having two years to bring a diverse population into universal fluency can make a big difference when children start to learn to read and write. As an immigrant myself, raising a bilingual child, I’m happy that Sophia will have concentrated classroom time spent mastering the language, even if it means she’ll probably be correcting my French by sometime next year. French public schools have no official ranking system, which is in keeping with the égalité part of “Liberté, Egalité, Fraternité.” Because all schools are funded by the state under the same standards, they are therefore all equal; it would be unjust to try to evaluate one over another. Also, French schools are not explicitly funded by property taxes, as they are in many parts of the U.S. So at least theoretically, there should be less difference in the quality of schools from neighborhood to neighborhood. Very few families petition to go to a school in another district, and by and large these requests are not granted. Private schools do exist, but the vast majority of the population—more than 85 percent—avails itself of the public options. The lack of independent evaluation is pretty disconcerting for an American; and by “an American,” I mean me. I want a U.S. News and World Report ranking system for the maternelles in my neighborhood, so I’ll know which ones are definitively the best for my daughter. I feel both ashamed of this impulse and also frustrated that there’s no way to really find out. I talked to parents in the neighborhood, all of whom assured me that my daughter’s maternelle is great, and all of whom gave me that quizzical Gallic look that made me feel like a crazy American for even asking. I also found out that my family is in a ZEP area, which stands for Zone Economique Prioritaire, referring to traditionally poorer districts where the government acknowledges that the schools might need a bit more help with extra funding and somewhat smaller class sizes. The flip side of this enforced independence is also an explicit teaching of the concept la vie ensemble: learning to live with others. Some of this may be a function of class size, some of it part of a general philosophy that places less emphasis on the individual and their needs. French people are wary of creating l’enfant roi: “A 5-year-old should be aware that he’s in an environment where there are rules that make it possible for us to live together,” Fortier says. “With 30 people in one small room, before you are an outspoken child, you should be able to listen. I have concern for every individual, but I need a group.” By contrast, studies of American preschools (notably by anthropologist Joseph Tobin in Preschool in Three Cultures) show an emphasis on the child as an individual, and on individual choice and self-expression. In general, I like that kids in France are taught this kind of social awareness, but it can go too far. There’s not a lot of coloring outside the lines in France, both literally and figuratively. This hints at the one area where France seems to struggle: special education. The emphasis is very much toward mainstreaming. A 2005 French law similar to the Americans with Disabilities Act calls for the integration of special-needs children into mainstream education, and a report last year for the French ministry of education shows that this integration is happening, especially for younger children. This is a laudable goal, but hasn’t been met with the budget to provide enough support staff; as a result, kids with mild to moderate learning disabilities (which include Asperger’s and Down syndrome) can be left to fend for themselves in a large class with a single teacher. In her class this year, Fortier has two children she describes as “seriously disabled” and she has no teaching aides or other help. She is conflicted about this. On the one hand, Fortier says, “the kids should know what a disability is, and if you have a disabled child in your class, it can help normalize this for other children.” But, she adds, “if you have 29 other children …” Fortier trails off. Though more and more large cities are providing public preschool programs in the U.S., it remains a world of haves and have-nots. According to a 2006 report from the anti-crime organization Fight Crime: Invest in Kids, the average cost of part-time preschool in California is more than the cost of a semester at one of the state’s public universities. Tuition for these often part-time programs can top $10,000 a year. Clearly, people who can send their children to a costly preschool can also afford to give them many other advantages. Universal preschool is an economically efficient way to narrow our widening gap between rich and poor, both by getting kids to a level playing field earlier in their lives, and by giving working families some relief from the ever-increasing cost of child care. Though the U.S. will never be able to implement a centralized government plan with the efficiency of the French, this is one area we should try to push forward—with or without lessons in table manners.